Now what I'm talking about here are players involved in this year's U18s currently underway in Fargo-Moorehead who can elevate their 2009 draft stock a great deal by the way they play in this tournament. I'm not talking about Magnus Svensson-Pääjärvi who might jump from top 8 to top 4... I'm talking about players who are outside the first round, perhaps not even rated right now by Central or ISS, who could parlay a big tournament into getting taken a couple rounds earlier than previously expected, or simply drafted at all. 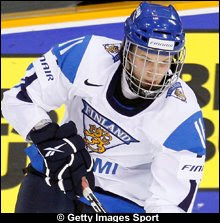 Nobody is really talking about the Finns this year because their really big names are going to be eligible for next year's NHL draft in 2010, that and the Swedes are so strong this year that the rest of Europe looks rather weak by comparison. "Regarded as one of the most talented players to come out of Finland in some time, Rajala has put up consistent scoring numbers as an underage player at every level, including internationally. A dominant perimeter player, Rajala could jump back into the favour of NHL GMs with another of those performances at this April’s World U18 Championship." Soudek played for the Edmonton Oil Kings in the WHL this past year and was not a player who caught attention on most nights. Every once in a while he would show a bunch of hustle that would raise an eyebrow but he could not sustain much from game to game. He was much better in March than he was in November though and I like Europeans who are better in the second half as opposed to the first which is what the stereotype is - Euros fade after the mid point of a North American season because of the heavy game schedule. At the U18's so far the Czechs have been pretty disappointing. They pushed Canada but are still fell short and sit 1-3 with losses also coming to Germany and Sweden. For his part, Robin Soudek appears to be holding his own. He actually has a couple points which is more than fellow countryman Andrej Nestrasil who is ranked 67th by both ISS and Central Scouting. Soudek meanwhile, isn't ranked by either scouting group so anything he can do at this tournament that leads to his name being heard on June 26/27th would have to be considered a huge success. OK, it's a cop out, I know. But the Swedes are so freakin' intriguing this year that you can't just overlook them but at the same time, all 5 players on my list could have been Swedes! Passing over the big names like Svensson-Pääjärvi (3rd), Ekman-Larsson (23rd) and Josefson (10th) there are a bunch of guys who could vault into the first round because of the way they play in front of the North American scouts this week. Carl Klingberg is one such guy. He's 6'3 and 205 lbs so you know the scouts are all over him because of his size but he's putting up points too. So far he's got 2 goals and 2 helpers in 3 games. ISS currently has Klingberg just outside the first round sitting in the 33rd spot. How about Anton Lander who ISS has ranked 40th right now? He's not as big as Klingberg but he might be more offensive minded as he's got a whopping 8 points already, second only to Mr. Paajarvi's 10. And don't forget about netminder Robin Lehner who TPS first started telling you about last Christmas but is really starting to generate discussion lately. 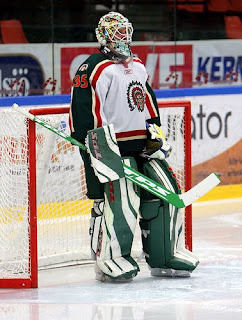 He's the 3rd best goalie available this year according to ISS (March) but I'm hearing people say that Frolunda's Lehner isn't much different than Jacob Markstrom who went early in the second round to Florida last June and was recently rated the best goalie prospect in the world by The Hockey News. Lehner is 6'4 and 220 lbs... I won't be surprised at all if he's ends up being the first goalie drafted this year. ISS has Lynch ranked 82nd overall while Central Scouting had him slotted 83rd just in North America in their mid-term rankings. 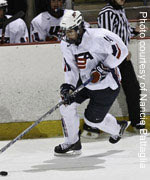 Lynch plays with the US-NTDP with a bunch of guys who are mentioned a lot more often than he is. However, right now in Fargo he's outscoring every one of those guys with a team high 9 points in 3 games. He's got 4 points more than anyone else on his team including guys like Jeremy Morin and Drew Shore, both are top-20 ranked players. Hell, his 5 goals are as much as any teammate has in points. Lynch is 6'1 and just shy on 190 lbs so he's got decent size. If you're looking for a player who is making a name for himself at the U18s... this has to be the guy for the Americans at least. He's unranked by ISS and Central Scouting has him way back at #102 in North America but Byron Froese is really coming out of the pack lately. 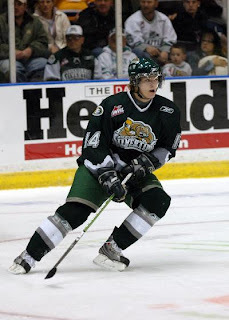 A source in Everett told me a while ago that not only would he make Canada's U18 team ahead of Silvertips rookie leading scorer Kellan Tochkin but that Frose would get drafted ahead of him too. Tochkin is ranked 137th overall by ISS but I think it's safe to say that Froese is going to skyrocket up the chart from unranked to top 100. In Fargo, Froese has a team high 6 points, tied with underage John McFarland and TPS guest blogger Ethan Werek. He's 6' and 178lbs but Froese is a tenacious character player that isn't limited to playing a checking role because he can also put up points. His 57 points were more than Landon Ferraro (55), Carter Ashton (50), Ryan Howse (44) and Cody Eakin (48) who are all considered top 2 round prospects. Byron Froese is a blast to watch, being part of the "Kid Line" in Everett he brought the team alive. The saying at the beginning of the season was " I guess no one told them they are rookies ". Byron is an asset to any team smart enough to grab him quick. ! Thanks for the comments guys/gals... since you've both seen them a bunch this year, you tell me: How are these guys different, similar, strengths, weaknesses, who should get drafted first, next and last among the three? Byron is awesome to watch! Although people could say that I am a little biased considering Byron is my soon to be brother in law! But even so his passion for hockey is amazing, and it shows on the ice!